There is something magical about Pueblo art. Perhaps it’s the uniqueness of it—it’s unlike pottery created by Native American Indian artists anywhere else on the continent. Maybe it’s the diversity of styles and designs even by artists in a relatively close geographical area. Possibly it’s that intangible connection with another culture and with Nature that each piece inspires. Whatever it is, we want you to experience it, and that mission informs the services and policies at Palms Trading Company. 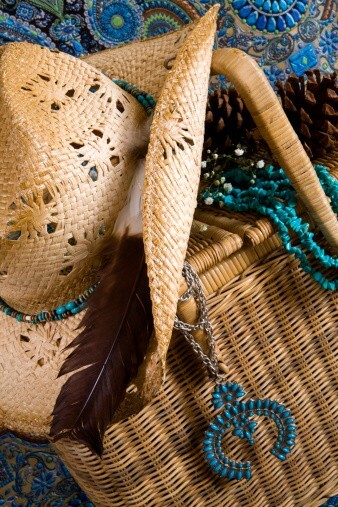 Palms Trading Company can help you find the best piece to fit your Southwestern décor, your hard-to-shop-for friend’s tastes or your growing collection by a particular artist. Our staff is made up of teams who specialize in different types of Native American Indian art—pottery, jewelry, rugs, etc. And among our knowledgeable staff, a buyer for the department is usually present. When you come into the store, you have a wealth of knowledge and experience in the Native American Indian art world available to educate you about the pieces, the artists, the cultures from which they come, etc. and to answer your questions. But shoppers outside of Albuquerque, NM still have access to our knowledgeable staff. Of course you can always contact us to pose a question, but we can do more than that. Palms Trading Company can actually do your shopping for you. Using our Personal Shopper service, you have virtual access to our entire inventory, including the pieces that come in after your request! Whatever you want, we’ll hunt through our inventory and send you pictures of what matches your description. If you like it, we’ll ship it. (Orders of $150 or more ship for free!) If you don’t, we’ll keep looking. We’ll even keep your request on file so that if nothing in our current selection fits the bill, we’ll notify you if something new comes in. If you get the piece and it just doesn’t seem to go with your earth-toned living room or you guessed your friend’s ring size incorrectly, you may return your item and find the piece that really does bring the magic of Southwest art to you. The magic of Southwest art is timeless and can last a lifetime if properly cared for, and Palms Trading Company can help you do that, too. Check our website and future blogs for tips on how to properly care for your sterling silver jewelry, stone jewelry, pottery, rugs, etc. If you have immediate questions, please feel free to contact us. A Note of Caution: If you are unsure about how to clean and care for your Native American Indian art, ask first! Some cleaning mistakes—like using soap and water to clean a dusty wedding vase—cause irreparable damage. And if you got your piece from Palms, it’s one-of-a-kind and can’t be replaced. In the event that your Native American Indian jewelry has a broken clasp, loose stone, etc., you can bring it to Palms Trading Company for repair. If there is any other way we can help you bring and keep the magic of Southwest art alive in your home, please let us know!